I hope Barb doesn't read this entry. I'm supposed to be working on a quilt project. Barb, if you are reading this just skip this entry. Tomorrow will be a better day for you to take a look at the blog. 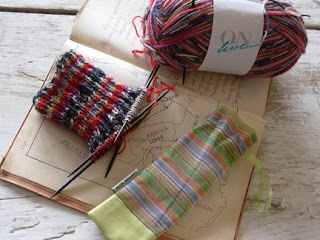 At the Moda designers' retreat Sandy Klop was knitting socks. I looked at her web-site and didn't see one sock on her site. Plenty of wonderful quilts...but no socks. Believe me she has made plenty of socks. She wore a new hand knitted pair each day. As I watched Sandy knit, she proceeded to tell me how easy it is to make socks. The more she knit....the more I wanted to make some too. Isn't that always the way? While spening the day antiquing in Abilene, KS, Sandy and I ran across a knitting shop. I'm a sucker for product packaging. 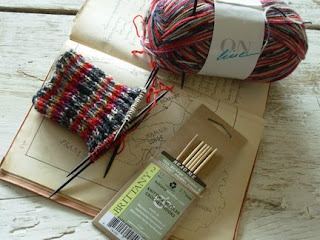 These cute sox stix needles came in a darling bag...never mind that I can't knit well...never mind that the knitting needles are $22.00 and never mind that every project I begin ends up in a bag in a closet. I thought....I must have these. Look at that cute bag!!! Doesn't it make you want some too? I had to get these needles too....never mind that I already purchased the dark ones...you never know when you will find a project calling for light colored knitting needles. Loved the yarn...it makes the stripes on it's own. Long story short. I began this project.....about 15 times and went to a local knit shop and pleaded insanity. The nice woman there helped me get it right. Here it is Sandy! 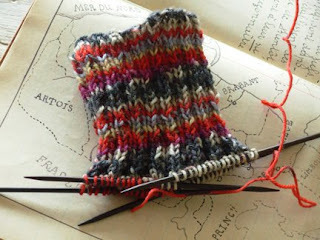 My sock in progress. I only have to knit 5" more before beginning the heel. I see another visit to the local knit shop to help me with the heel. Maybe I could just call my friend Cherie Ralston and tell her I will fix her lunch...and then just casually bring out the sock. My only problem is my Golden Retreiver Gracie ...really she's a Golden Recliner. 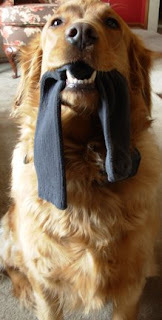 Gracie feels she is doing you a favor by bringing your dirty socks to you. 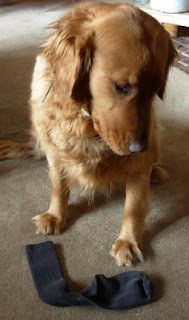 She nibbles a small hole in them first...If she gets one of these hand knitted socks she will be at the local dog pound hoping someone will take her home. Look at that face...don't be fooled. She's just thinking about gettng into trouble. Alma, you sound like me with the knitting! lol! I think I've managed to finish one sweater and one baby sweater and that's about it. The rest are hanging in my closet as UFOs. Sigh. You're doing great with the socks though. I should really learn how to knit socks. I have small feet and always have to buy children's socks. :D BTW, I'm glad you like my blog. I LOVE yours! And I'm so glad you've started blogging! You know I'm a huge fan of BBD -- both as a quilter and a stitcher. I agree Alma, many of my purchases have been all about the packaging. I think I have those $22 needles on a sock too. My puppy thought it smelled just like mom and ran around the room(happy feet) I have spent two years trying to figure out how to get it back in shape, no holes). 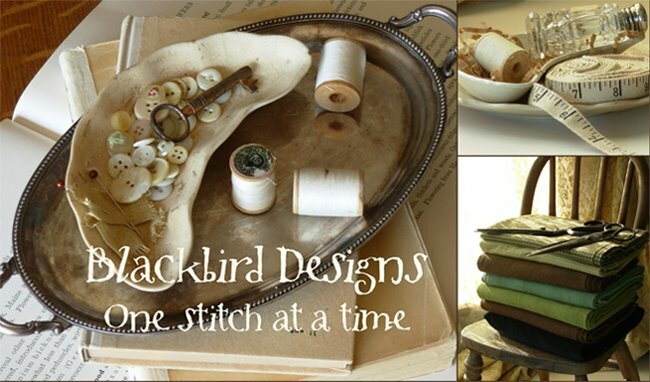 You have a very nice yarn shop, love the lunch idea! Best wishes! Somehow I stumbled upon your blog, and I'm so excited! How are you???? 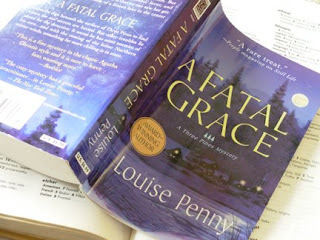 I recently entered this "bloggy" world, and I'm loving it. Such a great way to connect with friends all over the world. I love that you are knitting now. I haven't ventured into doing that just yet, but would like to learn someday. Please stop by and visit me at www.ljezak.blogspot.com. I'm delighted to find you on here, and really look forward to looking at more of your projects. Take Care and tell Barb "Hi" for me. Hopefully I will see you at quilt market soon. (Are you going to PA?) I can't wait! I'll help you, doll! You don't even need to make lunch... However, I should tell you I was having a bit of a problem this weekend with the socks I'm knitting, so maybe I'm the wrong one to help! Can't decide if I like the dog or the sock yarn better--oh--never mind--I'll take both--it's time to take a quilting break!!!!!! Hi Alma, so glad to find one of my favourite designers blogging! Those are gorgeous socks - I've come back to knitting recently after 20+ yrs, but haven't dared to tackle socks yet, though I'm tempted now. And what a handsome dog you have! I have always wanted to learn to knit socks. Bit intimidated by the multiple needles. But I too am a sucker for great packaging. I promise you Alma and gals, once you get through your first pair, the next pair will be a piece of cake. I am living proof. Last year I knit 27 pair. I can't sit idle in front of the television. My hands have to be busy. Everyone I know has a pair of sox that I made. Even my husband and he loves them. And Alma, I have the sox stiks too. Maybe in the next couple of days I'll post the 15 or 16 pairs I still have to my blog. Ok, if that ever happens, Gracie can move to my place :-) She looks so lovely that I'm sure I'll forgive her all her pranks. Hi Alma, I just found your wonderful blog and love it! Bummed out that I missed your sampler contest. Love little samplers and design my own. As for the socks, well....since 2001 I've knitted 267 pairs, have 12 boxes of sock yarn, and can't stop. It's like chocolate! DD is going to donate them to a homeless shelter when I die. Over the weekend hubby and I went to a small local fiber festival where I found some hand-dyed cashmere sock yarn in yummy colors - pansies, hycacynths, bittersweet, and washed cranberries!